← Yes, we are alive! A bright start to the Second Stage was somewhat dimmed last week when we dropped two points away at Hiroshima, the game ending 2-all after Marinos led 0-1 at half time. Due to the vagaries of J.league results, however, we found ourselves moving up a place to the top of the table after Frontale also drew, goals scored putting us ahead of our local rival. 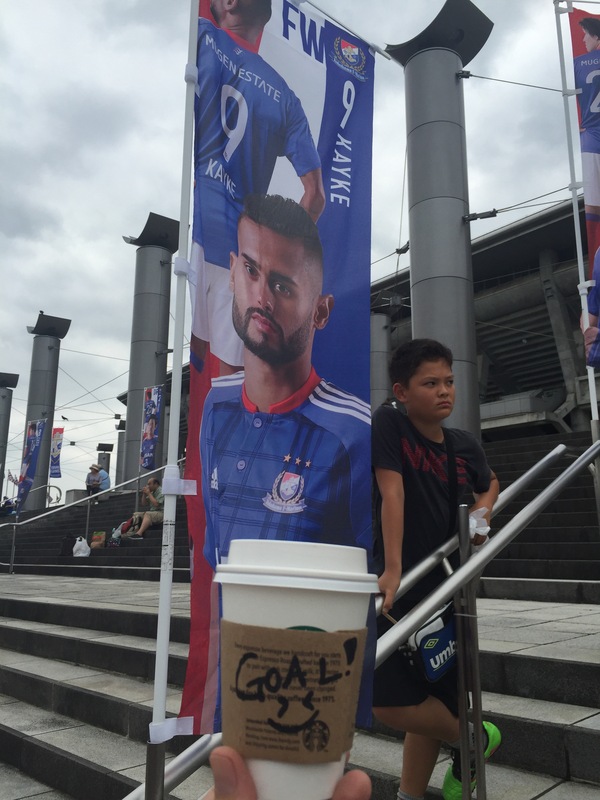 Who’d have ever thought that Marinos would be capable of scoring a statistically significant number of goals? We took the same starting XI onto the pitch against Jubilo, our 4-2-3-1 led by Kayke on top with Shunsuke in the hole, Manabu and Martinus on each side. Jubilo were at full strength, their attack led by Jay Bothroyd, who was absent in our 5-1 away drubbing of Iwata in the first stage. The signs were positive enough in the first half, we seemed to want to continue the attacking mindset that was shown in the second half fightback against Vissel Kobe and the first half against Hiroshima. Panzo Kobayashi was more eager to push his passes in front of Manabu (and behind the defence) for the dribbler to run on to, whilst Kanai, Manabu and Shunsuke continued with some neat (and dangerous) combinations down the left as we’d seen in recent weeks. Kayke, who had still been lukewarm to cold despite our recent good results, seemed more mobile and keen to be involved in the build up than he had done previously. Our goal came from the right, created by aggressive pressing of the opposition when we weren’t in possession. Jubilo tried to build up slowly on the right up towards the centre line. However, Shunsuke raced forward to put pressure on Jubilo’s Kobayashi Yuki and pounced upon an under hit pass. Sliding in to trap the ball from under the nose of Holland-bound Jubilo midfielder, Shun then stood and passed forward to Kayke, who cut inside and slid a ball forward for Martinus motoring across Kayke’s path to scissor through the defence. The Curacaoan winger cut back the ball for Kayke who had continued his run forward and the Brazilian slotted it home past the outstretched right hand of Iwata’s keeper. From the intercept to the one-touch pass and finish, it was an impressive team goal. Jubilo’s goal early in the second half was a lovely strike from mid-range that should never have been allowed to be taken. A one-two in a neat triangle by-passed Kida just forward of the centreline, whilst Nakamachi moving in to cover was simply too content stand off and track Kawabe rather than close him down. Given the space, Kawabe decided to try his luck and hit a cracker from well outside the box, the rocket somehow squeezing between Enomoto’s desperate dive and the near post. We created a flurry of chances after the equaliser and one that probably went over the line but was missed by the linesmen. Manabu was frustrated by the lack of a square pass from Martinus that would have put him on to an empty goal, but then minutes later wasted a great chance heading Shunsuke’s pin-point cross to the far post wide from short range. The match finished a very frustrating one-all draw, two points dropped for the second time in a week. However, we can’t blame the result on any external factors like referees mistakes. Like the Hiroshima game, once having taken the lead (after only 25 minutes this time), we showed little desire to kill the game off with a second goal. All too content to sit back and let the opposition mount attack after attack, we invited disaster and disaster struck two weeks running. Having seen in the second half against Kobe and the first 30 minutes last night what positive, attacking – dare I say, exciting – football this team is capable of, it is extremely disappointing to see us revert to the plodding, safety-first style that we’ve seen too much of under both Higuchi and Mombaerts, managers more intent upon playing not to lose rather than playing to win. Next match: a must-win at home against embattled Nagoya Grampus. 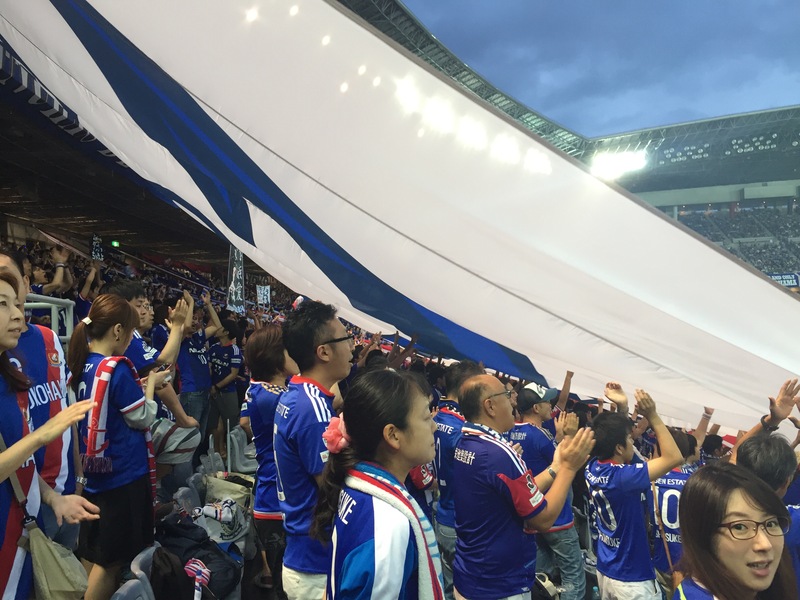 Their last win was back in May – against… Yokohama F.Marinos!